When I was in San Antonio Saturday, my best friend dragged me to the old Farmer’s Market – dragged is too harsh, that makes it sound like I was kicking and screaming and I wasn’t. I was happy to go and see something new, was excited about it really, except I looked past the archways from the street and my stomach sank… people. Lots and lots of people. Crowds didn’t bother me much when I was younger, they couldn’t, I went to a 5A highschool and if you were nervous in a crowd you’d drown in a sea of elbows. (I realize now that maybe they did, I just often had a hand to cling to – my now husband – when walking through those crowds, not sure my bestie would be down with me grabbing her hands to hold in public… doesn’t stop me from wanting to.) Doesn’t change the fact that I see one ahead these days and I have to summon a purpose or desire for something in that crowd in order to enter it. In this case, food, art, and music. My trifecta that gets me through the festival experience. I love those things. And even though the Market was crowded – the worst of it at Mi Tierra – there was a little bit of space and I found myself able to breathe. 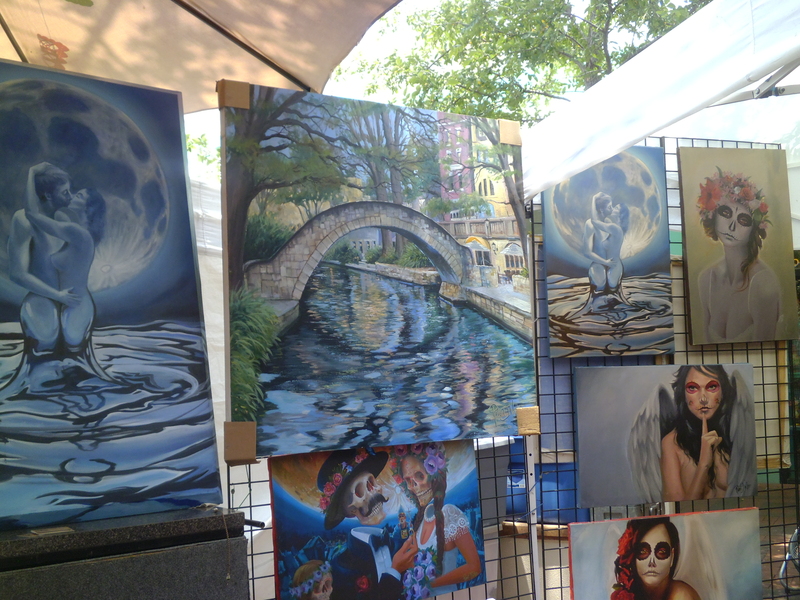 Especially once I got myself to the art booths. Right outside Mi Tierra I stumbled across two separate booths. One for Joseph Hernandez Jr. (www.josephhernandezartist.com) and one for Robert Wilkens (robertwilkensco@sbcglobal.net). This is Joseph Hernandez Jr. 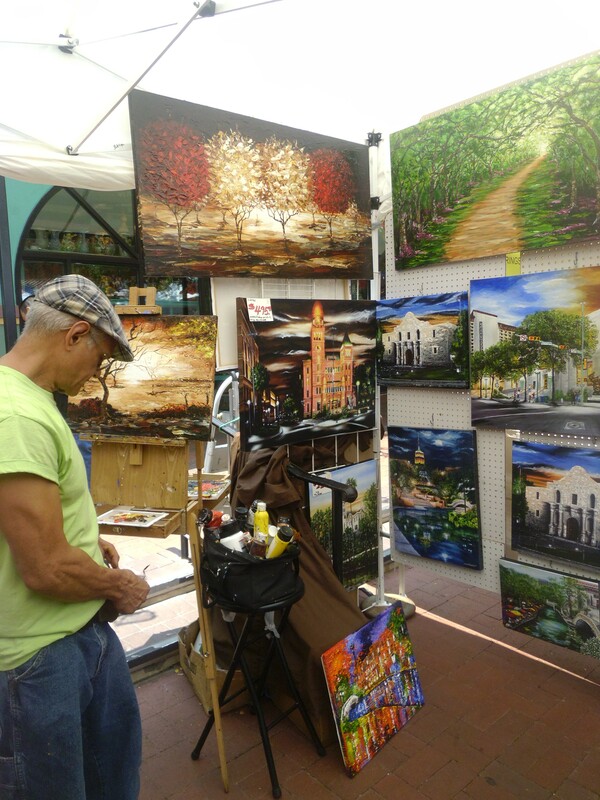 He paints vibrantly, is self-taught, and stands about as tall as me. I could have stood in his booth and looked at every single painting for hours. If I were wealthy, I would have bought one of everything. My house would become a gallery to his work. I loved all the color. His use of it reminded me of Bryan Collins work even if their styles are nothing alike. 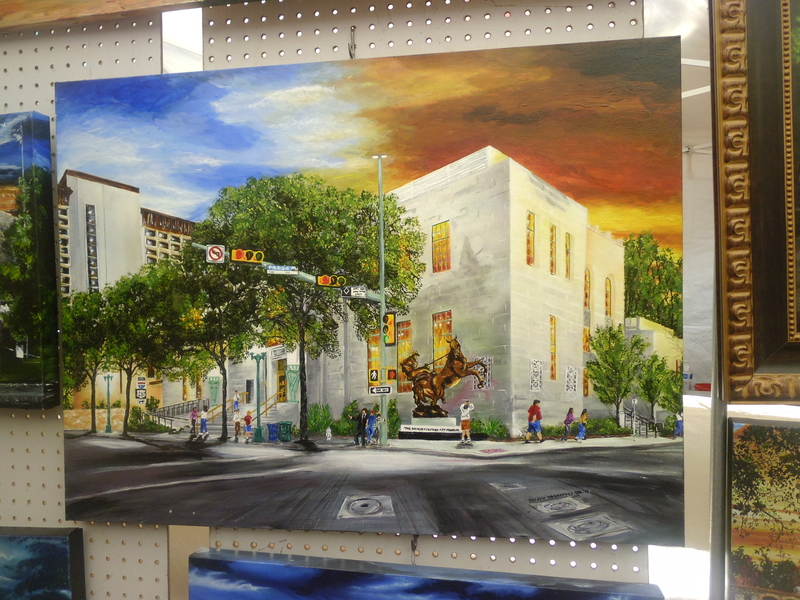 Much of his work is perfect for the tourist or native San Antonio lovers. He chooses places around town to capture on the canvas. Far more valuable than any photograph you could take of the same location. He has just as many paintings of a random assortment, random things that inspired him… trees and branches are a running theme for him. He had a lot for musicians – a sax, a violin, mu sic notes, etc. I can’t imagine walking into his booth and not seeing something you want to take home with you. The hard part is deciding which something. Only a few booths away, closer to the Mi Tierra entrance, was Robert Wilkens – or Roberto as his wife kept calling him, and I can’t get her voice and pronunciation of his name out of my head. She’s gorgeous and so passionate about his work. I asked to take a picture of his work and later found out that most people just take the pictures – they don’t generally ask first. I’m used to museums and conventions, rather than festivals, and I always ask. Otherwise you might find yourself being barked at. Robert and his wife were very gracious and let me take as many pictures as I wanted. 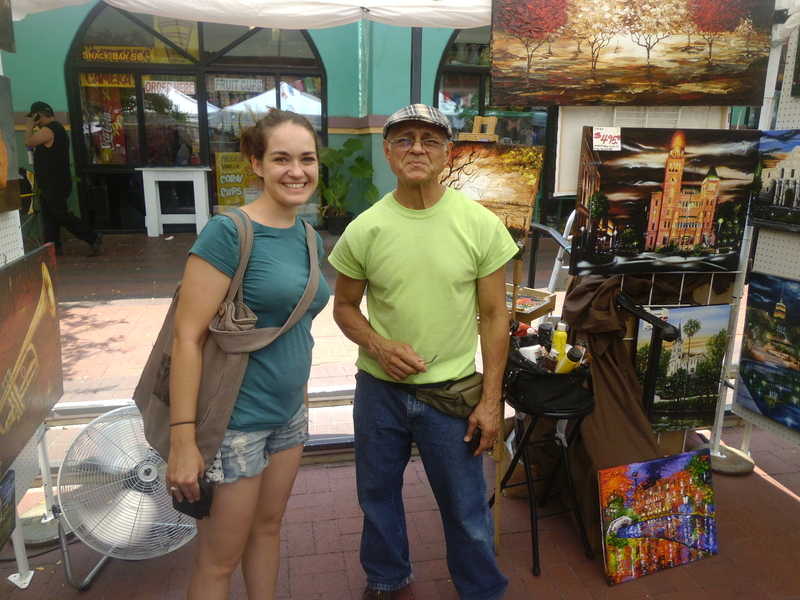 Robert is a chatterer, and I enjoyed talking to him while I watched him paint. He teased me about my tattoo – told me it said “Soy Sauce in Chinese, didn’t you know?” I picked on him for assuming I didn’t know what my tattoo said, just because I was a white girl. Some things are funnier in my head than they are out loud. Either way, Robert and I had a nice long chat about artistry and professions. We showed him a picture of my kiddo’s art work. We talked about books and my career as a writer. “When did you first know you wanted to write?” he asked me. “The moment I realized that ink came out of a pen and formed words on a page,” I answered. He’s been a painter for decades, but he took the long road it sounds. He had a lot of people tell him he couldn’t make a living at it. It’s clear that he can, his work is incredible. We talked about how we encourage that artistic spirit in our children. 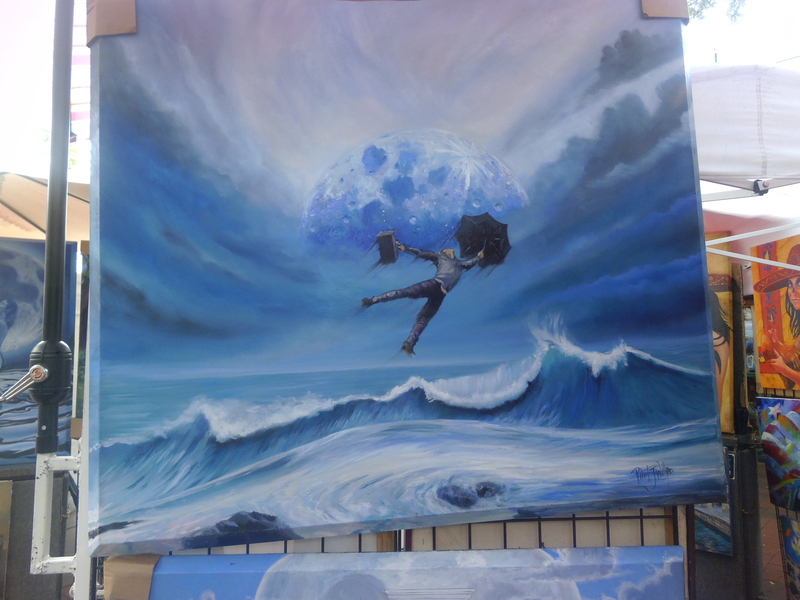 My daughter – the child of a writer – is quite the little painter. His daughter – the child of a painter – just might be the next great American novelist. He was a muralist for a long time, you can see the remnants of that life in some of his work. I love it, and I want him to come do some walls in Houston that need sprucing. Artist – Muralist, Robert Wilkens has been in the arts for twenty-five years and has worked commercially for fourteen years. He is well established in all media of the arts. 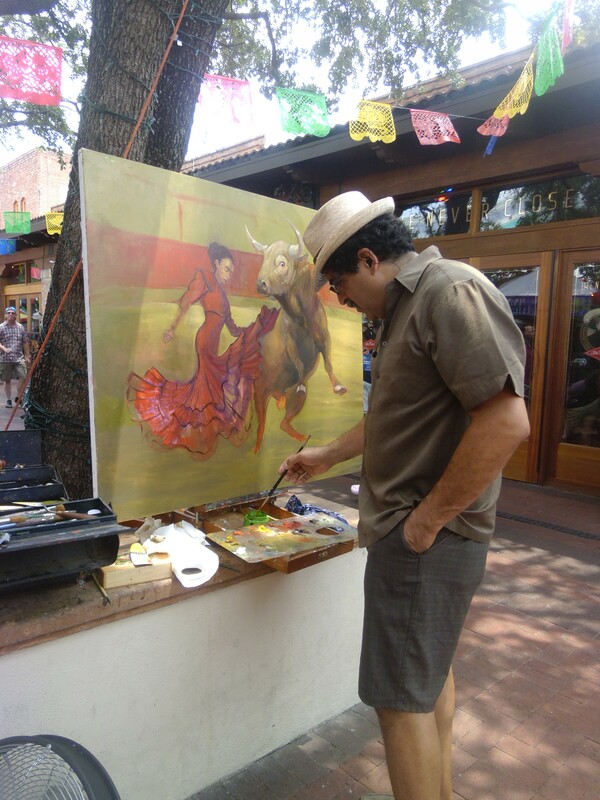 Robert’s talent and dedication to his work has taken him to Mexico and all over the United States of America, even to the White House in the service of the First Lady, Laura Bush. There is no other artist of Roberts caliber when it comes to working with clients. His work ethics are honest and the beauty of his brush strokes while painting murals are eloquent and always precise. I couldn’t stop looking at it and I wanted it for my wall. He didn’t have any prints available for it, but said he would ship to Houston if only I let him know. I want the original. It’s magnificent. The detail in the water and his pant leg is stellar. I wanted to be swept away with him, from the dirty street and into that clear, blue water, up to the moon. It helps that I find suitcases and umbrellas terribly romantic. It helps that I find travel romantic. It helps that adventure fascinates me, even if it makes me a little nervous, I still want to experience it all. I want to absorb art through my eyes and bathe in it. I want to taste new foods and close my eyes and live the flavor. I want to meet new people and really discover who they are before I leave their presence, even if it takes a little bit of work to stay focused on what they are telling me. I want to be dazzled. I want a print of that last one too!! !